Read up on the sites you’re thinking of playing at with our comprehensive reviews so that you don’t choose the wrong online poker room. One of the world’s must trusted & respected brands. Consistent traffic in both cash games and tournaments. Easy to play from mobile, tablet, PC, or Mac. 100% up to $600 free for new players who make a deposit. 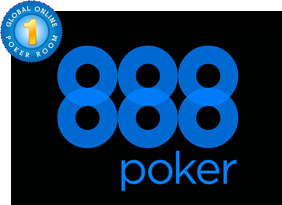 888 offers new players a 100% matched deposit bonus up to a maximum of $600. Deposit $100 for a $100 bonus, $600+ for a $600 bonus, etc. Once the deposit has been made, players must collect 100 Bonus Points for every $10 of the bonus within 90 days. Each time 100 BPs are collected $10 of the bonus will be released. BPs are awarded at the rate of 2 points per $1 in rake/fees paid. The cashback rate of the bonus 20% ($600 / $3,000). No bonus codes are required. Bonus: $22 in Free Tickets. Bonus: 200% up to $2000. Bonus: 100% up to $500. Bonus: 100% up to $1,000. Bonus: 200% up to $1,000. Bonus: 200% up to £500. Bonus: 200% up to $750. Bonus: 100% up to $300. Bonus: 1000% up to $2,000. Bonus: 200% up to €1,500. Bonus: 100% up to $400. Online Reviews on FTR: Only the Best Online Poker Rooms! As an aspiring online poker player, the choice of a site to play at is one of the most important decisions you could make. In order to help our readers sort through the dozens or even hundreds of companies offering online poker, we’ve reviewed all of the top brands. Different sites have their own particular strengths and weaknesses, and a poker room that is good in one area might not be so great in another department. For this reason, we’ve broken up each review into sections that deal with a specific aspect of online poker. Keep reading to learn how our reviews are structured. 1 Why Play at a Poker Room? Why Play at a Poker Room? Here at FlopTurnRiver, we don’t partner with just any online poker room. For every site that we feature, there’s a good reason why we’ve chosen them. You can get a broad overview of why a particular poker operator is worthy of your consideration in this part of the review. Only part of a poker player’s profits come from actual play at the tables. Another valuable component of your total return will come in the form of bonuses and other promotions. While almost every online poker room offers some sort of rewards, the types of promos available and their relative merits will vary greatly from site to site. We’ll let you know what kind of welcome bonus to expect at each site and give you instructions on how to claim and clear it. If there are any ongoing promotions of note, like rake races or freerolls, we’ll highlight them for you. Finally, we’ll describe the VIP program and tell you what kind of rewards you can expect if you become a regular player at the poker site. At one time not so long ago, the history and background of most Internet poker sites was a tabula rasa. The industry was too new for any companies to have distinguished themselves. But now that we’ve seen the online poker market grow and mature for more than a decade, we have a good idea of the reputation and reliability of the major operators. We’ll tell you of areas in which the site has distinguished itself over the years, as well as any high-profile errors they’ve made or controversies they were involved with. Some new poker sites are run by entities with long histories in other types of gaming. We’ll be sure to mention any of this experience that we know of so that you can get an idea of the safety and dependability of the poker room. Your entire experience at an online poker provider will be shaped by the quality (or lack thereof) of its poker software package. We’ll tell you how smooth the gameplay seems, if there are any features lacking in the poker client, and if there’s anything about the software that makes a site stand out from its competitors. We’ll get into the details of not only the desktop versions of the poker software, but also any web-based functionality that the site offers. We’ll inform you of the availability of Mac and Linux downloads so that you can find a site that’s compatible with the systems you use the most. Although some poker sites stand alone, others are part of a network of interconnected sites. We’ll explain what network, if any, a site is a part of and how much traffic there is. In some cases, a site may have plenty of traffic in certain games but hardly any in others. We’ll try to give you a good idea of how easy or difficult it will be to find a game running in your favorite variety of poker at stakes you want to play. Most sites accept dozens of funding methods, like Neteller and Skrill. There’s a lot of variation once you get to the more geographically specific or smaller payment options. We’ll attempt to provide you with a complete list of the deposit and withdrawal methods so that you can play at a site that makes it convenient for you to move your money around. Almost every Internet poker room has minimum and maximum transaction amounts, and we feel that we should present this important information to you. We’ll also tell you about any withdrawal fees that are charged. Mobile poker is an exciting and increasingly popular option for busy people on the go. We’ll inform you of any iOS, Android or Windows Phone apps that are available to let you play on your smart device. In some cases, only a few types of games are offered on mobile and some of the features of the desktop version may be absent. We’ll tell you how the mobile action at a site shapes up compared with its desktop offering. The truly great poker firms offer exceptional customer service. The options available at different sites include live chat, email, and telephone support. We’ll tell you what your choices are when you have a problem and need to contact someone. We’ll also give you an idea of how responsive and accurate you can expect the answers you receive to be. Almost every site has its advantages and drawbacks. By carefully considering each factor as a piece of the overall tapestry at a specific poker site, we can draw broad conclusions about the types of players who can benefit from playing at that room. After going through the attributes of each poker room in detail, we’ll give you our concluding thoughts so that you can make the best possible decision. You should certainly take advantage of the wealth of information contained within our reviews. Whenever you’re thinking of opening a new account with a poker operator, check out what we have to say in our review. It will only take a few minutes and might save you considerable trouble. As always we wish you good luck at the tables!